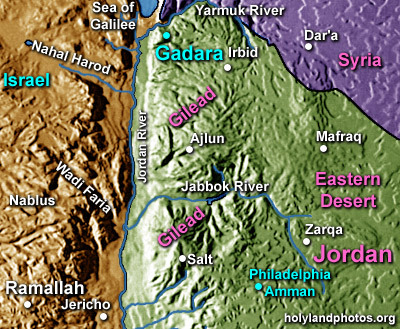 The village of Umm Qeis (New Testament Gadara) is located 51 mi. [82 km.] north northwest of Amman. It is situated on a small plateau 1240 ft. [378 m.] above sea level overlooking the Yarmuk Valley to the north, the Sea of Galilee to the northwest, and the Jordan Valley to the west. This Greco–Roman city was founded around 200 B.C., continued in existence until the eighth century A.D. and was resettled during the Ottoman Period (A.D. 1517–1917). It was one of the cities of the Decapolis and was famous for its philosophers—it was even called a second Athens. In Matt 8:28 a city of the “Gadarenes” is mentioned in connection with Jesus healing a man possessed by demons—casting them into a herd of swine that ran down a cliff into the Sea (of Galilee). The “reading” of “Gadarenes” is problematic and interested persons are encouraged to check the various commentaries or for a “Wikipedia” article Click Here (compare Mark 5:1 and Luke 8:26). The site has been excavated in recent years by a German team.